I'm taking a trip to the library today. I’m in need of a good read. It calls for a brief getaway. So many books, but which to choose? Or a lightly singed edition of War and Peace. Might I check the rubble for a classic? Recounting a great battle fought long ago. I feel the first drop of rain. Thank you for reading, Keke-bear! Wow! All those books just left to the elements. Times like that, the escape through others words was even more valuable. Excellent, Jeff! Yeah, I can imagine when crammed in a metro tunnel with hundreds of other people, a book was about the only sanctuary the mind could find from the horrors above. Thank you for reading this piece, Hully. It was an image I couldn't pass without writing something for it. 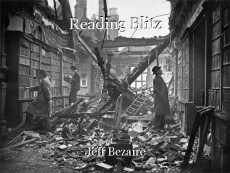 There were a series of images of England during The Blitz, but this one stood out the most.